The team at tyres-guru.co.uk is here to offer you more than just tyres. In addition, you can also shop for complete wheels. Whether you prefer complete wheels with alloy or steel rims is entirely up to you. Check out the huge steel wheels with summer tyres selection by many top brands. If you are looking for stylish wheels to get you through summer, you have come to the right place. Keep in mind that tyre size and the correct tyre profile are important. That is why we offer you our useful vehicle selection tool so you can choose whichever steel wheels are the perfect choice. 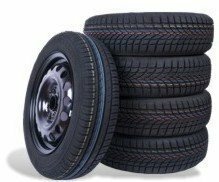 Once you are ready for a seasonal tyre change, we also bring you steel wheels with winter tyres or all-season tyres that perfectly fit your car. Shopping our huge tyre range certainly has its advantages. After all, you will not only find well over 100 trusted brands here. In addition, you can also count on free delivery to your mainland UK location. In this way, we are able to bring the price of our tyres down even more. In addition, we work with a number of tyre fitting stations. Make an appointment so that you will not have to change your new tyres yourself.